As he prepares his Michigan Wolverines for the Orange Bowl, Jim Harbaugh's name is already swirling in the NFL rumor mill with the Rams firing head coach Jeff Fisher. 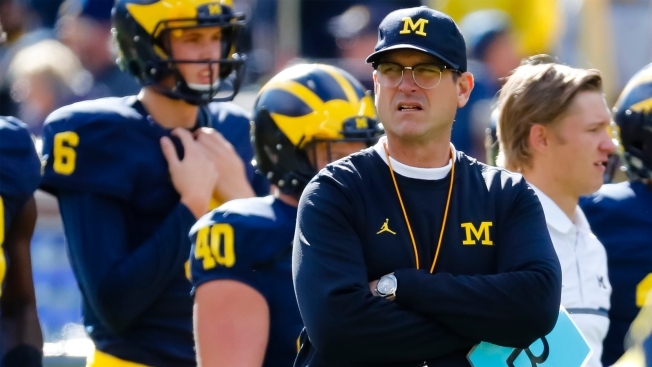 But, it sounds like Harbaugh put an end to those rumors with his players in an emphatic way. "He said '(I'll keep this) short, sweet and to the point: I'm not leaving,'" Michigan's fifth-year senior defensive tackle Ryan Glasgow said Tuesday prior to the team's annual football bust in Livonia, according to MLive.com. "He said (the NFL rumors) are 'lies made up by our enemies.'" After a successful four-year stint with the 49ers, it's no surprise Harbaugh's name came up for LA. In four seasons as the 49ers' head coach, Harbaugh finished with a 44-19-1 regular-season record. Harbaugh also went 5-3 in the playoffs and led San Francisco to Super Bowl XLVII, in which he lost to his brother John's Ravens, 34-31. "He said 'You're stuck with me,'" said Glasgow. Since taking over as Michigan's head coach in 2015, the Wolverines have gone 20-5 and won the Citrus Bowl last year. One year before Harbaugh was at the helm, Michigan went 5-7 and just 3-5 in the Big Ten Conference. The 49ers, currently riding a 12-game losing streak, are 6-23 since "mutually parting ways" with Harbaugh after the 2014 season.